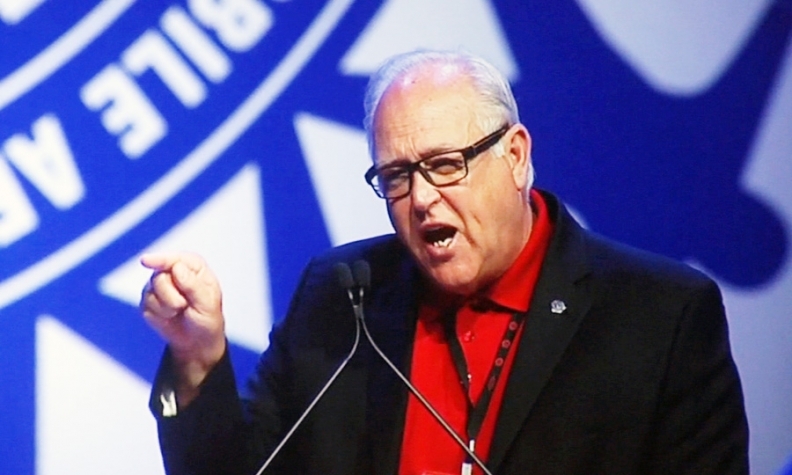 UAW President Dennis Williams: "Our goal is to raise everybody up and bridge the gap." DETROIT -- In a fiery address to hundreds of UAW delegates, union President Dennis Williams said auto workers sacrificed during the recession and now must get that compensation back. “Our goal is to raise everybody up and bridge the gap,” Williams said, referring to the UAW’s plan to close the pay gap between veteran auto workers and entry-level Tier 2 workers. Tier 2 workers at the Detroit 3 earn between $15 and $19 an hour vs. $28 for legacy workers. Tier 2 workers also receive roughly half the benefits of their veteran co-workers. In the speech at the union’s bargaining convention here, Williams declared that the union plans in the upcoming negotiations with the Detroit 3 to roll back Tier 2, not expand it. He rejected the notion in a recently published report that Ford Motor Co. and General Motors wish to create a third tier of workers who would earn even less than Tier 2 workers. “We’ve got too many damn tiers now,” Williams said to thunderous applause from delegates. Tier 2 is the big topic of the bargaining convention. Delegates speaking here have unanimously called for it to be either drastically reduced or eliminated outright. Williams reaffirmed the UAW ideal that workers should earn the same compensation for like work. “We believe in equal pay for equal work,” he said. The bargaining convention is held every four years before Detroit 3 collective bargaining to set directions for the negotiations and to unify the rank and file. The UAW’s four-year contracts with the Detroit 3 expire in September. Rolling back Tier 2 will be daunting. It has become deeply entrenched in the four years since the Detroit 3 started hiring again after the recession. All of the nearly 33,000 auto workers hired by the Detroit 3 since mid-2011 have been Tier 2. The group now represents 29 percent of the Detroit 3’s hourly U.S. work force. At the end of the last contract in 2011, there were only a handful of Tier 2 workers at the Detroit 3. The Detroit 3 argue that Tier 2 has been crucial to allow the companies to create jobs in the United States. Despite Tier 2, Ford and GM are still at about a $10-an-hour cost disadvantage compared with U.S. operations of the German, Asian and Korean automakers, said auto analyst Kristin Dziczek in an interview this month. The two U.S. automakers pay about $59 an hour vs. the high $40s for the transplants and Fiat Chrysler, said Dziczek, director of the labor and industry group at the Center for Automotive Research. Costs for FCA US are low, too, because Tier 2 workers are about 42 percent of its work force. Williams started and ended his speech asking for unity from the rank and file in the upcoming talks with the Detroit 3. The rank and file must ratify any agreements that are reached.